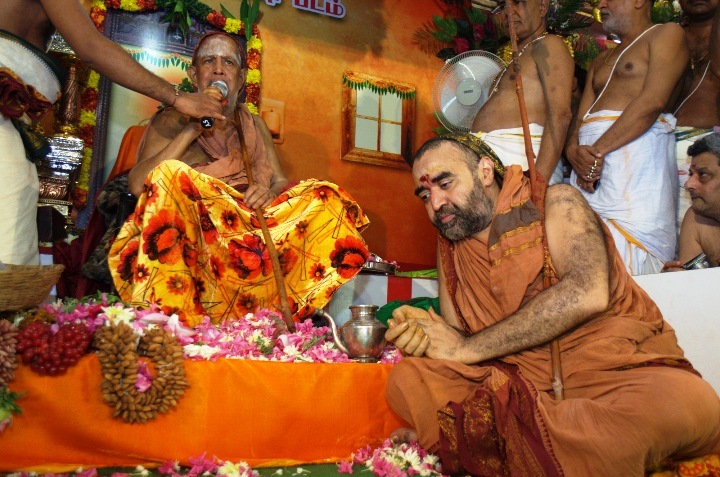 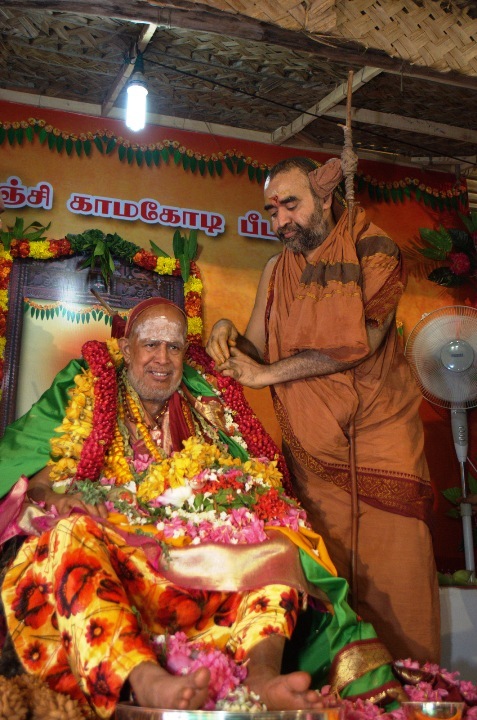 The 80th Jayanthi of His Holiness Pujyasri Jayendra Saraswathi Sankaracharya Swamiji was celebrated at Shrimatam, Kanchipuram with devotional fervor. 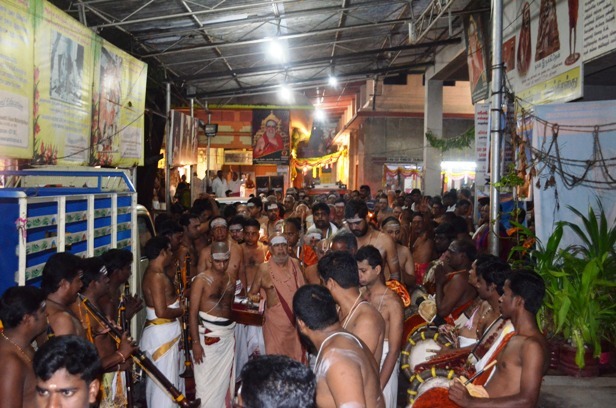 Early in the morning, His Holiness blessed the devotees with Viswaroopa Darshan. 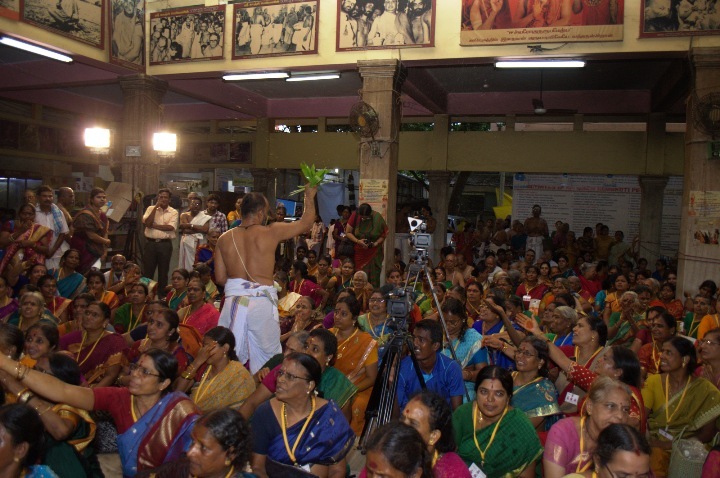 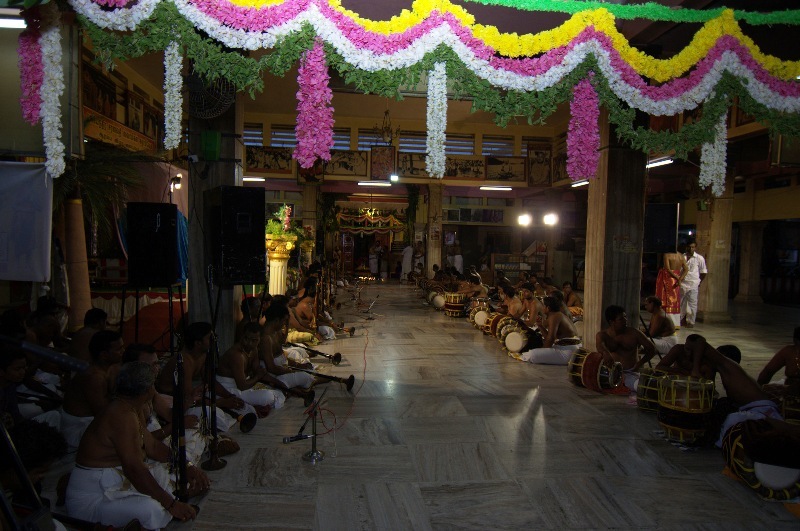 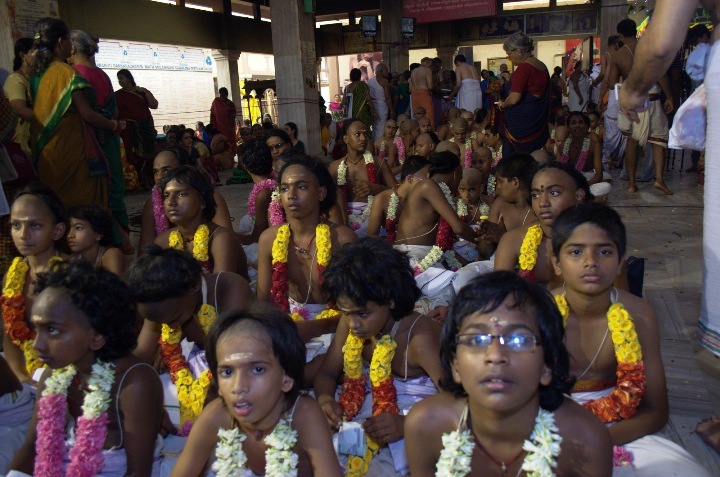 80 Nadaswaram groups played the Mangala Vadyam. 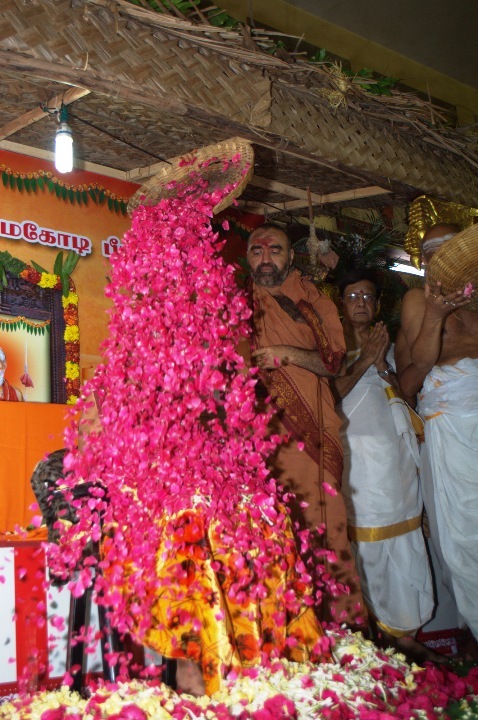 At the Adhistanam of Pujyasri Chandrasekharendra Saraswathi Mahaswamiji, His Holiness offered flower garlands and shawl and offered His prayers. 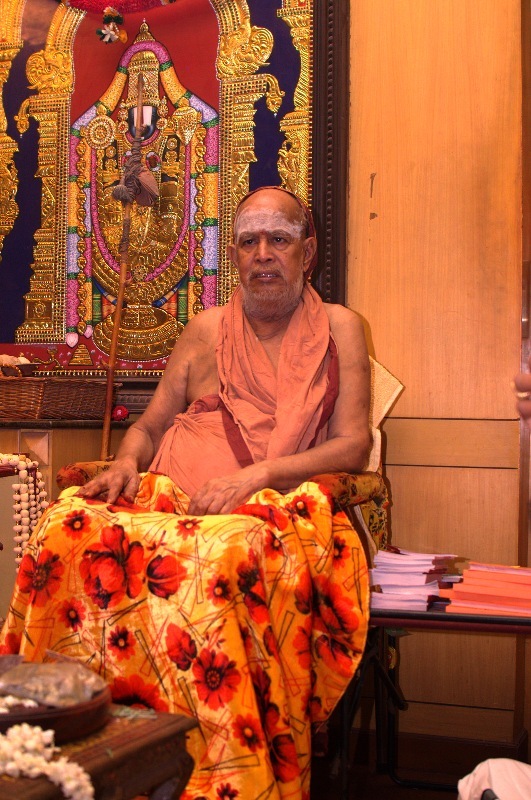 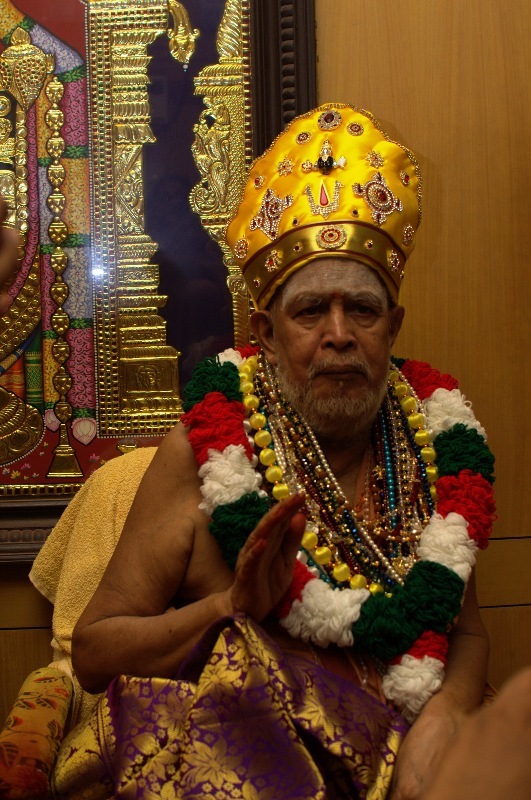 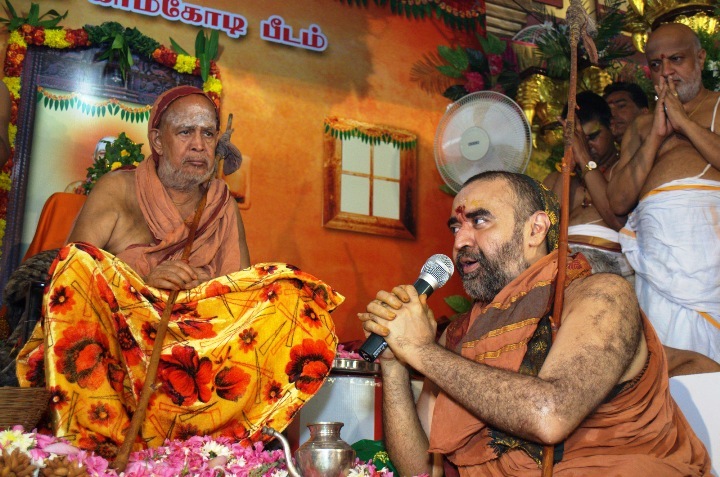 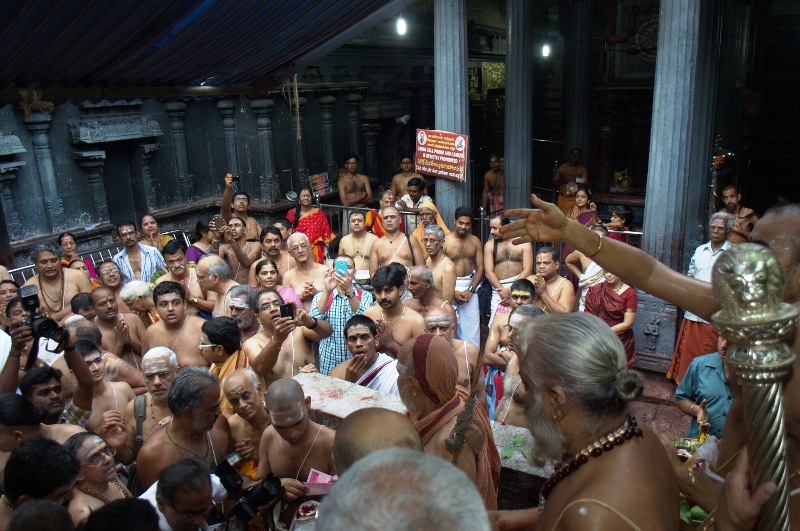 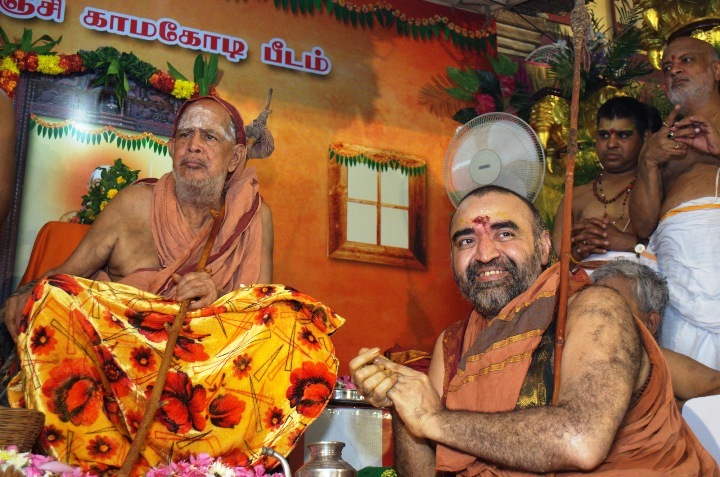 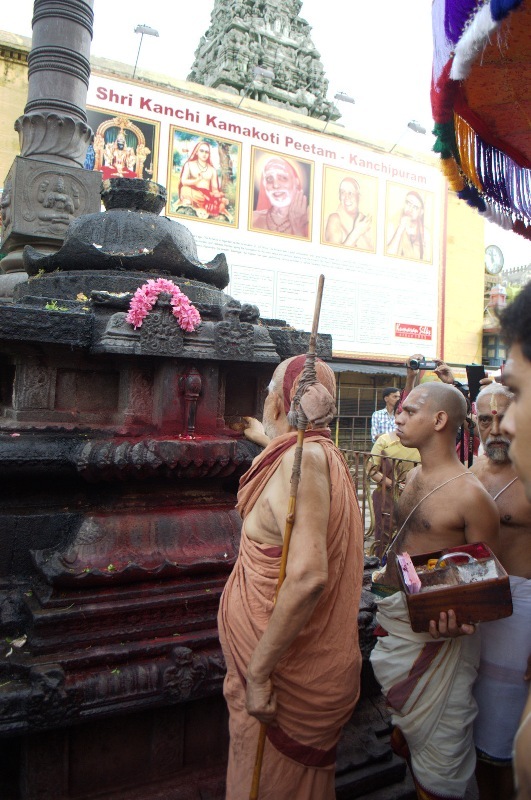 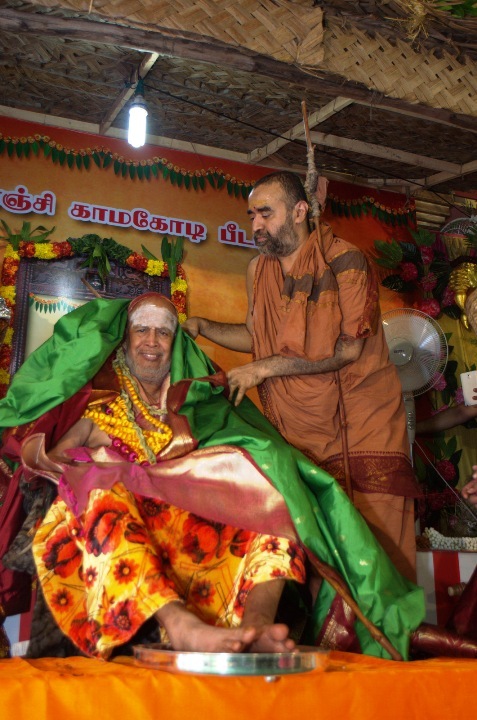 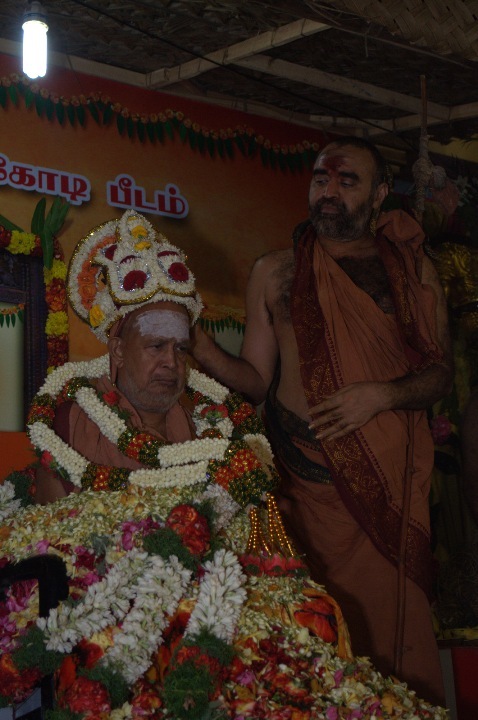 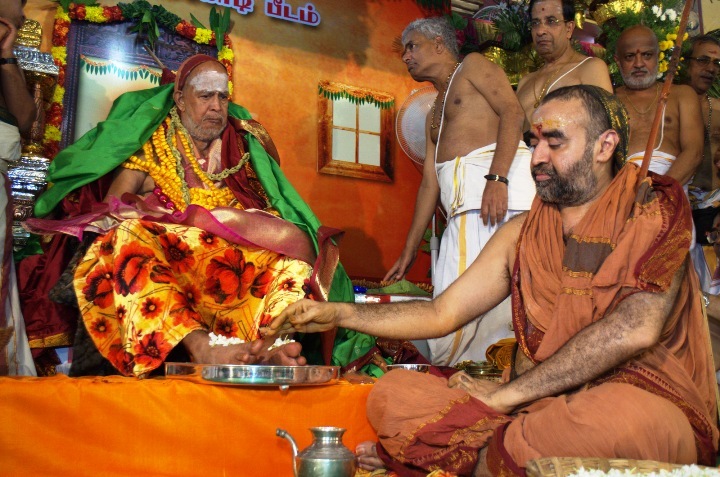 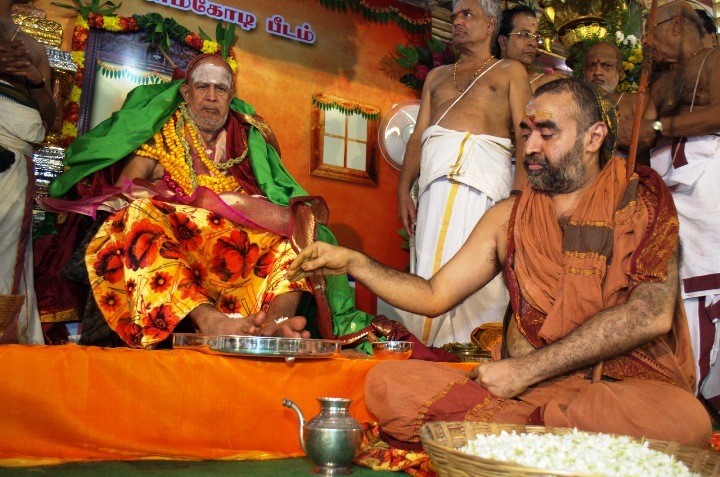 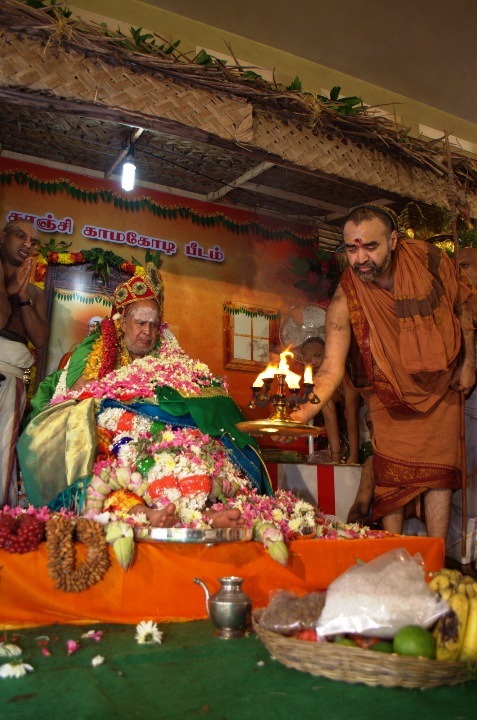 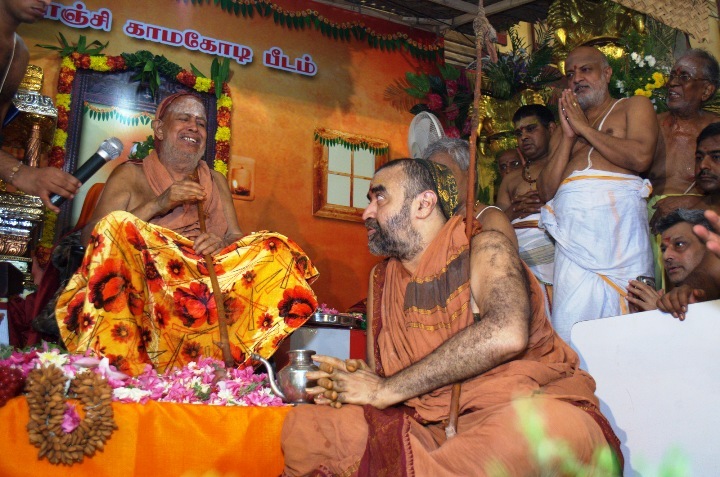 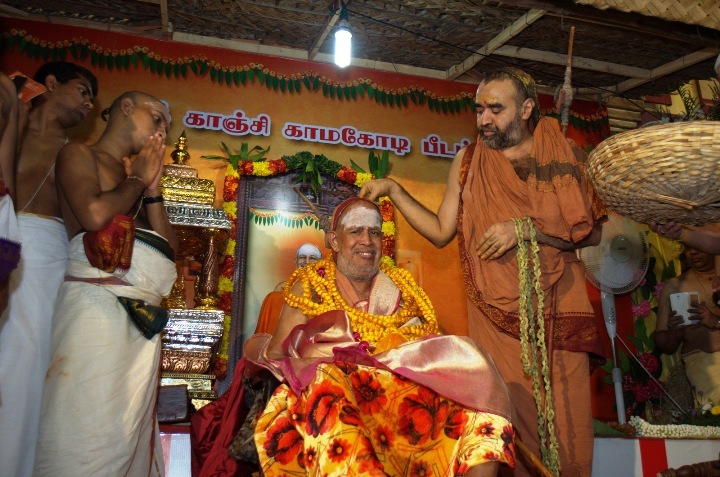 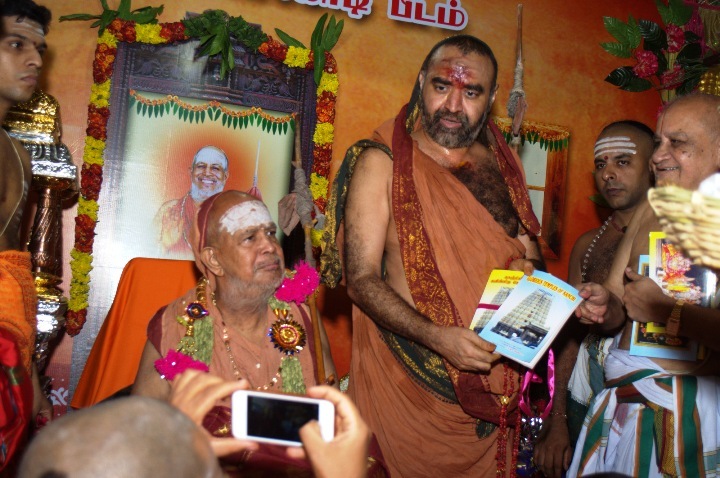 His Holinesses Pujyasri Jayendra Saraswathi Shankaracharya Swamiji went to the Kamakshi Ambal Temple and performed Abhishekam to the Goddess Kamakshi. 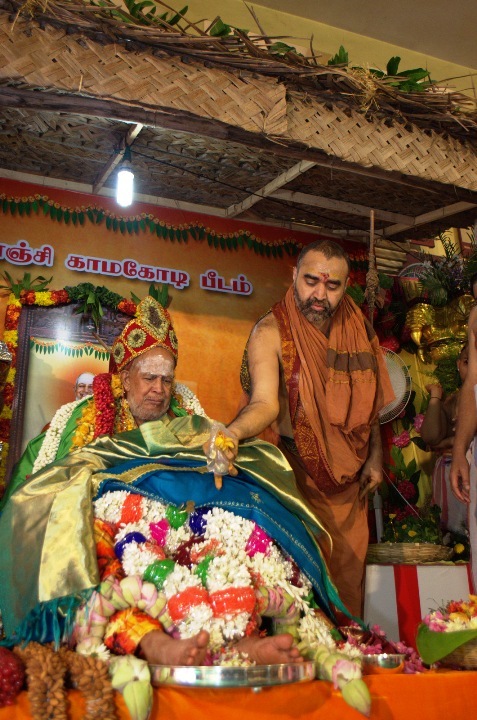 At the Kamakshi temple, His Holiness was received with traditional Poornakumbham. 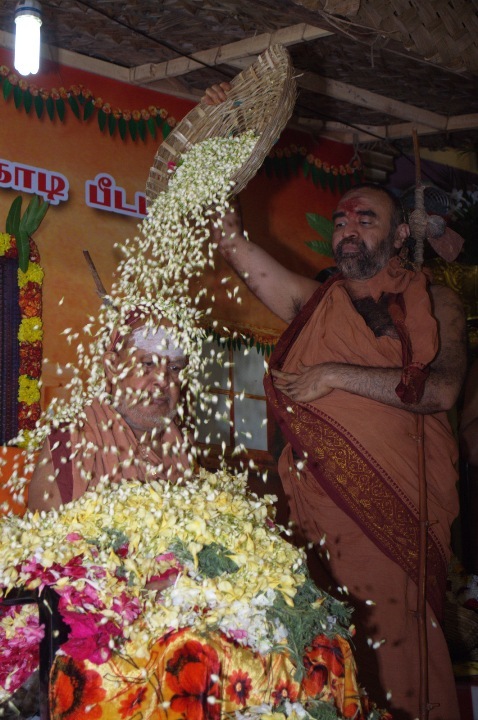 His Holiness performed Abhishekam with the 108 pots of milk to the Goddess Kamakshi. 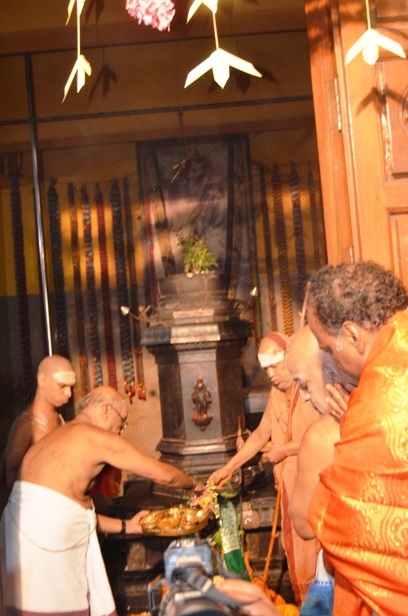 After completing the Puja, His Holiness offered prayers at Sri Adi Shankara's Shrine in the temple, where temple prasadams and temple honours were accorded to His Holiness as per tradition. 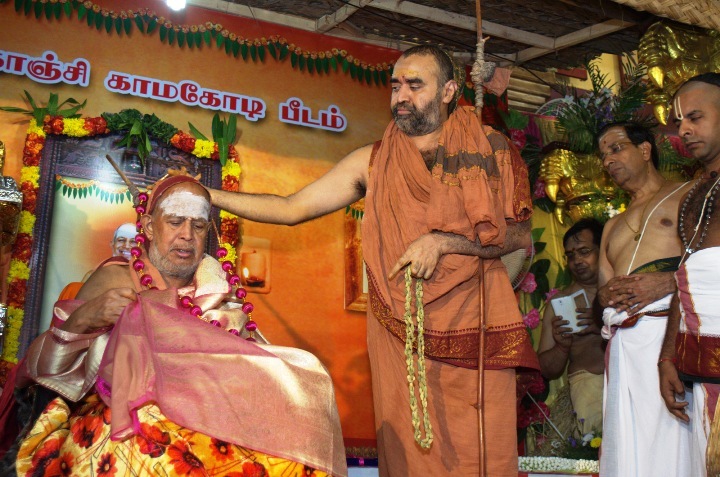 Pujyasri Sankara Vijayendra Saraswathi Shankaracharya Swamiji performed Swarna Pada Puja to His Holiness Pujyasri Jayendra Saraswathi Shankaracharya Swamiji with the ashtotram of His Holiness being chanted. 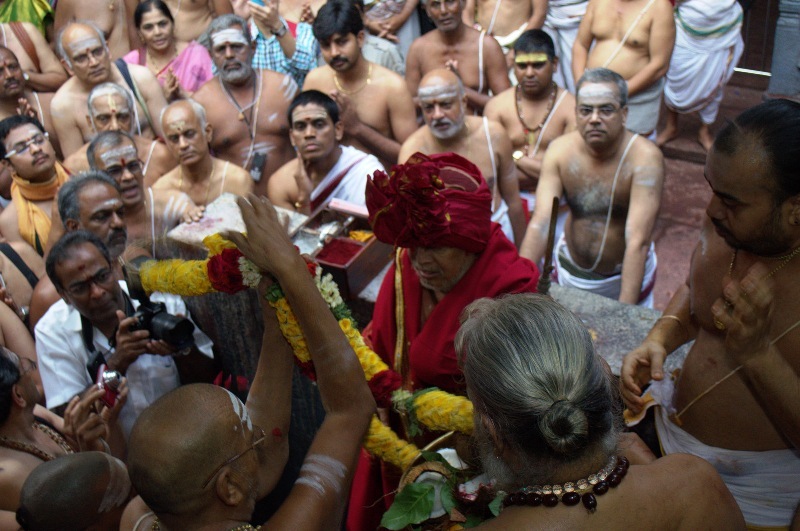 This was followed by Pushpabhishekam to His Holiness. 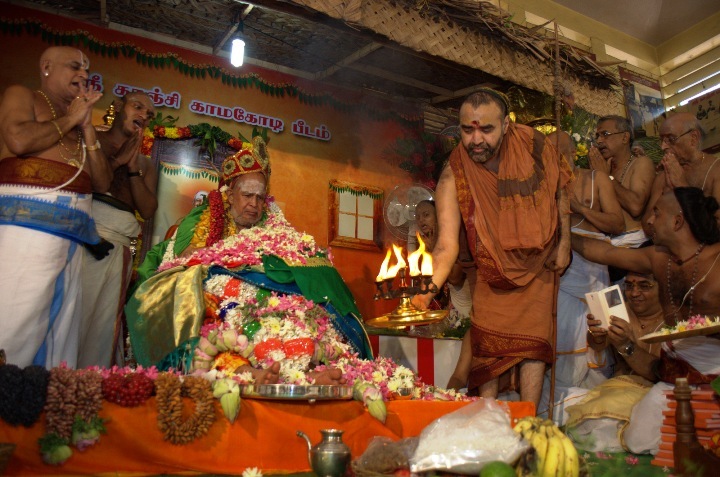 Pujyasri Sankara Vijayendra Saraswathi Shankaracharya Swamiji performed abhishekam to His Holiness Pujyasri Jayendra Saraswathi Shankaracharya Swamiji with a variety of flowers and offered flower garlands and Kreetam, followed by Deeparadhana. 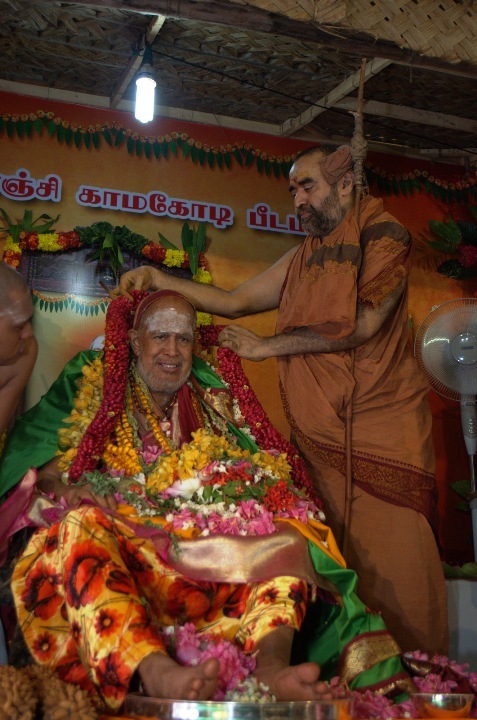 Prasadams from various temples in Kanchipuram and other places including Tirupati were offered to His Holiness. 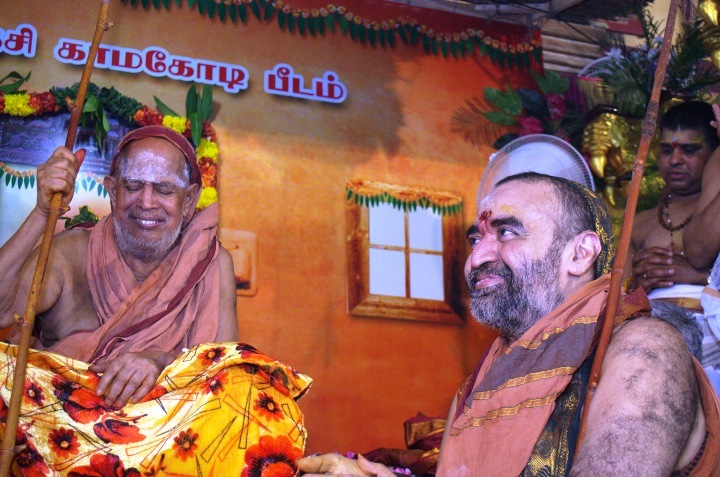 Maharudra Poornahuti took place in the presence of His Holiness. 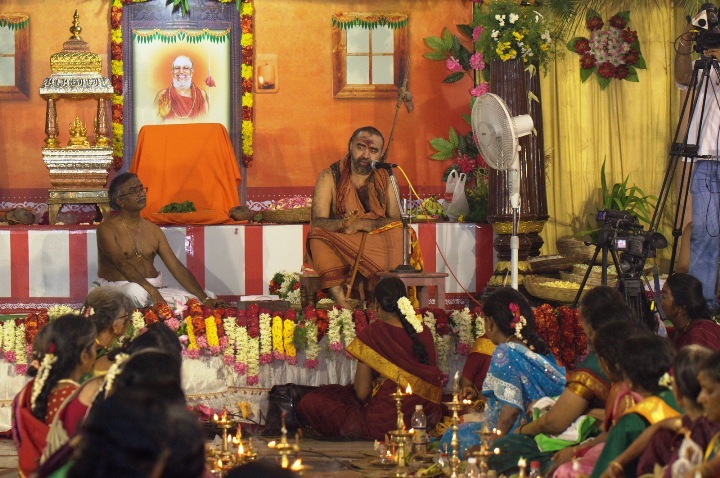 Srimatam was decked with toranams, flower garlands and colourful lights. 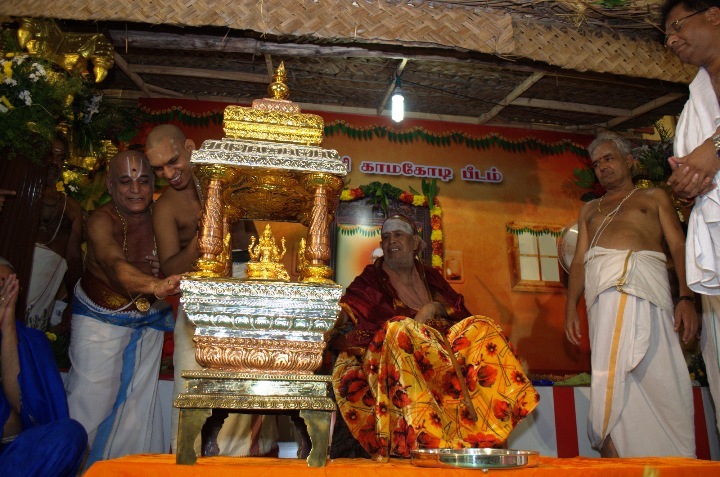 The Puja Mandapam was decorated with garlands of Fruits and Vegetables. 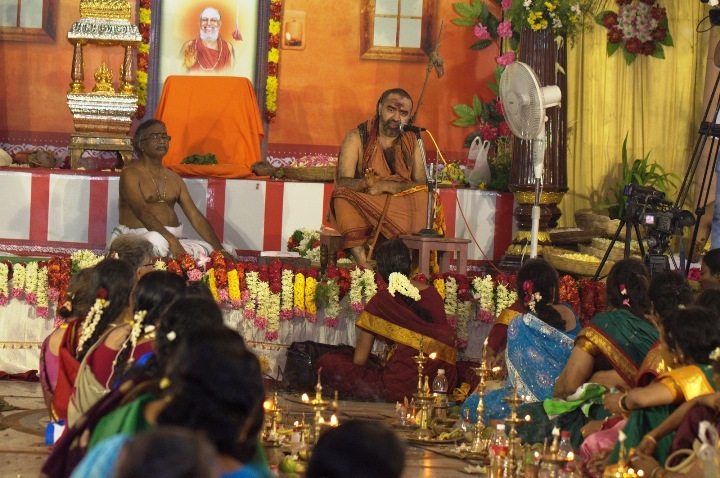 Various programmes including Veda Parayanam, Homam and other cultural events took place at Srimatam. 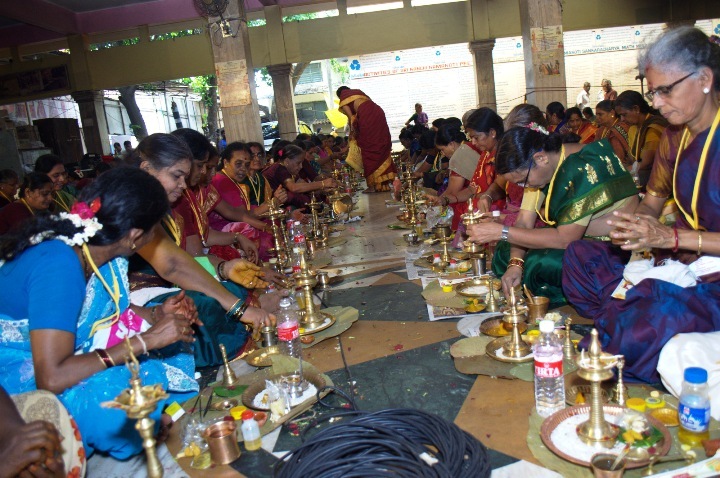 Dampati Puja was conducted as part of the Mahotsavam. 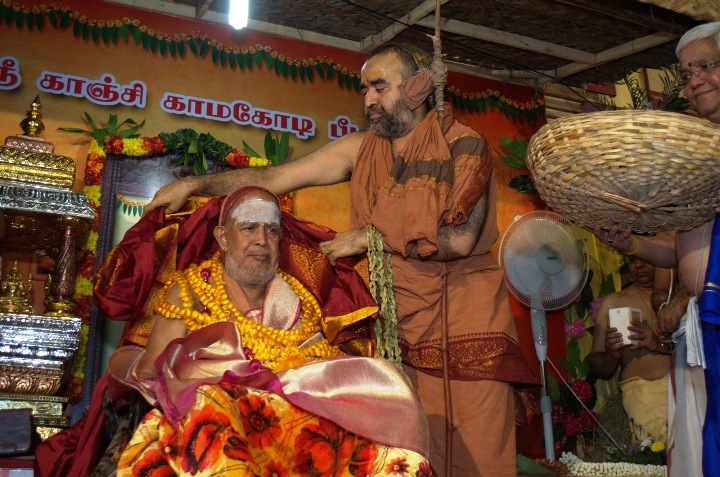 His Holiness blessed the participants. 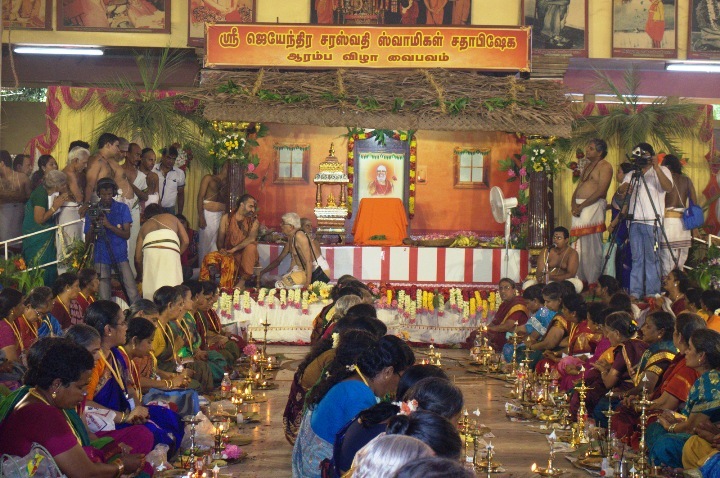 Deepa Puja was held in the evening. 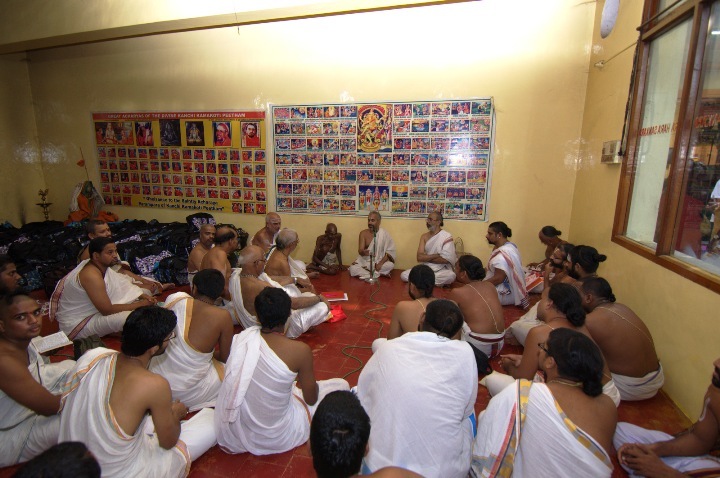 Rig Veda Ghanapatis who took part in various events were given honours and sambhavana. 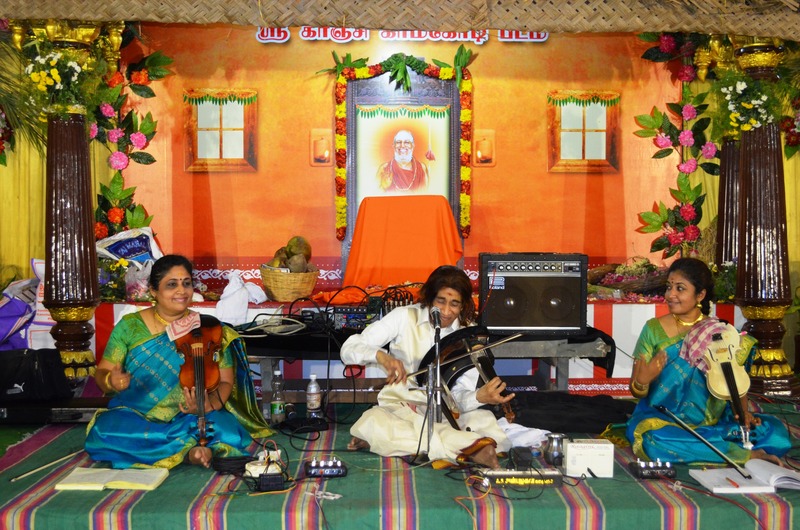 A musical recital took place in the evening. 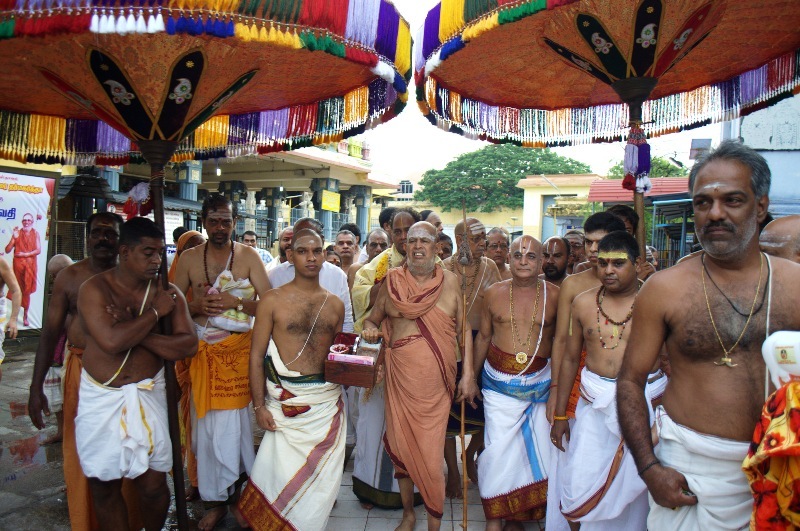 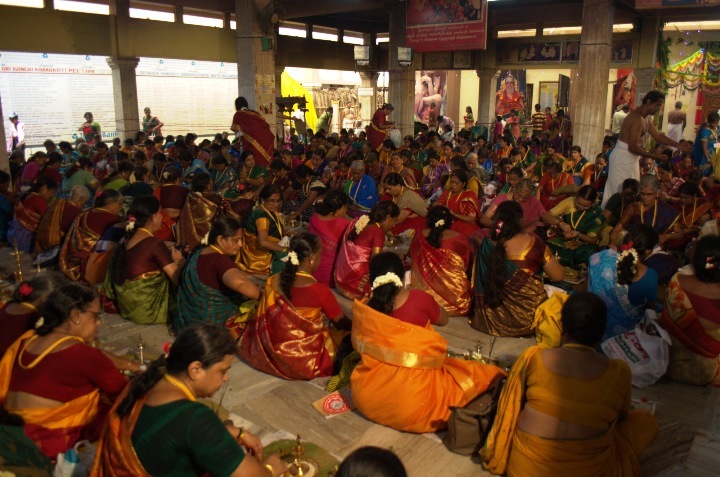 A large number of devotees took part in the Jayanthi celebrations and received the blessings of Their Holinesses.